When your grill is caked and covered in grease from a hard days work, it’s time to turn to the one machine that can make it all go away, with the push of a button, Grillbot. 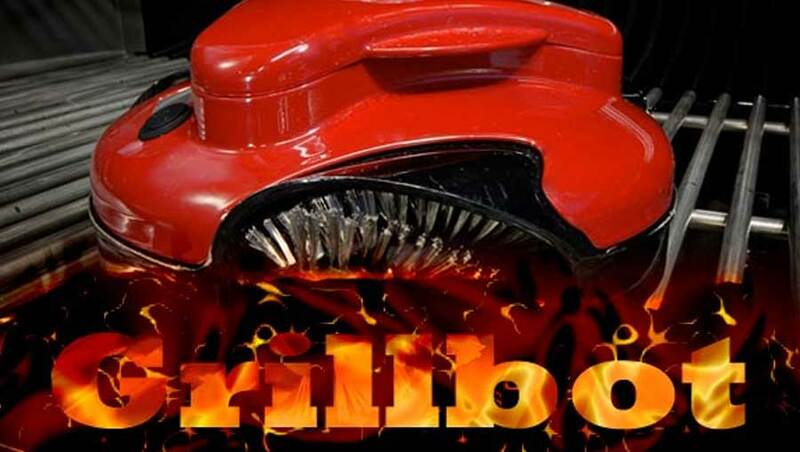 Grillbot is advertised as the grill cleaning robot that does all of the dirty work for you, with its three powerful electric motors spinning three wire brushes, that scrape away baked on crust that usually make cleaning the bbq grill a hassle. Whether your grill is hot or cold, Grillbot has the cleaning covered and features a built in LCD controlled timer to let you know when the cleaning is complete and an audible alarm for when the Grillbot is finding the grill a little too hot for comfort. The included AC adaptor and re-chargeable batteries means Grillbot is always ready for action and the wire brushes can easily be removed and popped in a dishwasher for easy cleaning. Grillbot features state of the art technology which allows it to roam independently around your grill surface, giving it a deep clean in minutes, while you get back to the party. Say goodbye to the scraping and brushing that takes the fun out of bbq’s and grilling and say hello to your automated friend Grillbot, the world’s first and best automatic robot grill cleaner. So, if you are thinking about buying a Grillbot, let us show you what to expect when your grill cleaning robot is delivered to your door. To get you started, you will first have to remove the Grillbot from its packaging, hold the Grillbot by the top handle and place to one side so you can read the quick start guide and the owners manual. Before you first use the Grillbot, you will need to charge him for approximately eight hours, or until you hear the little fellow beep and don’t worry his built in sensor will prevent over charging. When you are ready to use your Grillbot, first make sure your grill is on a flat, even surface and also make sure the grill is below 250°, never use your Grillbot over an open flame. Place your Grillbot on the grill grate, press the button once for a ten minute cycle, twice for a twenty minute cycle and three times for a thirty minute cycle. There will be a five minute delay, to allow you time to close the grill lid. If your grill is too hot an alarm will sound and Grillbot’s motors will stop automatically. Grillbot will let you know when cleaning is complete by automatically shutting down and emitting an audible bleep. Now let’s talk about Grillbot’s brushes, to clean them remove by holding the robot upside down, grip the brush by the ends and use your thumb to press the release button on the outside and remove the brush from the axle. Wipe the bottom of the Grillbot using a damp cloth or degreaser, the brushes are dishwasher friendly, or you can simply rinse in soapy, hot water. After the brushes are clean, simply line up the notches with the slot and snap them back into place, by slipping the brush back onto the motor shaft, pressing until the brush clicks into place. Grillbot’s replaceable brushes are available from Amazon.com, Grillbot comes with standard brass brushes but for a more robust clean try the stainless steel brushes, recommended for non-coated grill grates. Grillbot loves to scrub, so put him to work as often as you like, he will never complain.